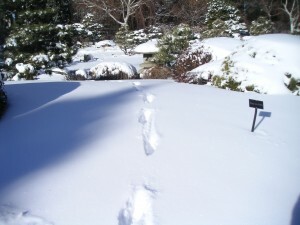 With the return of sunshine this week, I headed out into the Gardens for the first time since the most recent snowfall. As my shoes squeaked on the cold snowy paths, I squinted across glittering white expanses, and I realized that when you and I are not there to observe, this place becomes a fox and coyote playground! Tracks are everywhere: dashing across the Perennial Walk and into the Romantic Garden, darting up and over the Birds and Bees path, running circles around Sacred Earth, tripping across Woodland Mosaic, and creating superhighways through the Japanese Garden. 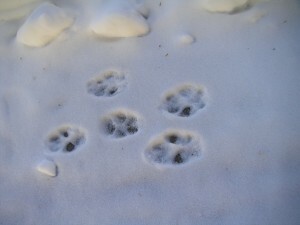 This week I caught a glimpse of a fox, but these animals are shy, and for the most part, tracks are all you’ll see. And speaking of elusive animals, I just finished reading The Conjurer’s Bird, by Martin Davies. I checked it out of our own Helen Fowler Library, at the recommendation of librarian April Miller. This well-assembled historical mystery traces the true story of a mysterious bird, Turdus ulietensis, of which one specimen was found on Captain Cook’s second voyage. It was preserved—or was it?—but a living example of this bird was never seen again. The author tells the parallel tales of a modern-day hunt for the missing specimen, and the 18th-century story of naturalist Joseph Banks and his companion, a brilliant botanical artist. The characters and scenes are artfully drawn, and Davies has a strong sense of why people act as they do. I highly recommend this one. Take advantage of the winter quiet to make your own discoveries at the Gardens this week.